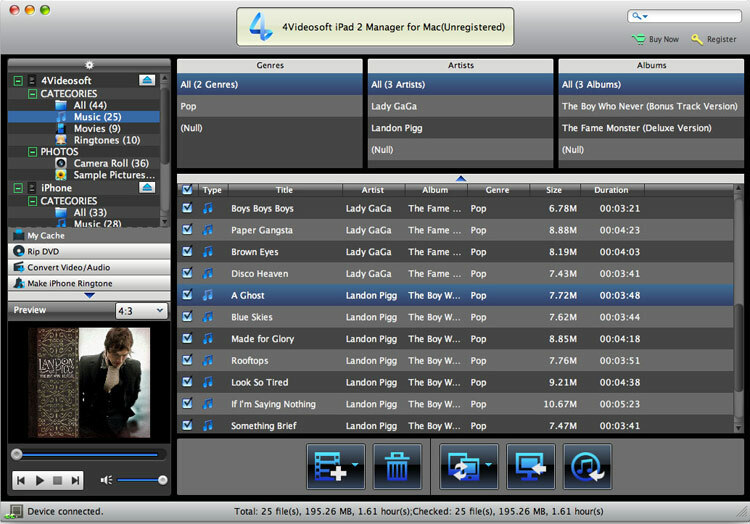 4Videosoft iPad 2 Manager for Mac is an excellent Mac iPad 2 Manager, which can transfer videos, audios and images between iPad 2 and Mac. Furthermore, it can also convert DVD files and videos to iPad 2 supported formats. Also, it possesses other convenient features, like displaying all iPad 2 information automatically. In addition, the files are sorted by Genre, Artist, Album, so Mac users can find what they want quickly and easily. Transfer iPad 2 files to Mac, and import files or folders on Mac to iPad 2. A client and contact manager for tarot readers. Qweas is providing links to 4Videosoft iPad 2 Manager for Mac 3.2.36 as a courtesy, and makes no representations regarding 4Videosoft iPad 2 Manager for Mac or any other applications or any information related thereto. Any questions, complaints or claims regarding this application 4Videosoft iPad 2 Manager for Mac 3.2.36 must be directed to the appropriate software vendor. You may click the publisher link of 4Videosoft iPad 2 Manager for Mac on the top of this page to get more details about the vendor.